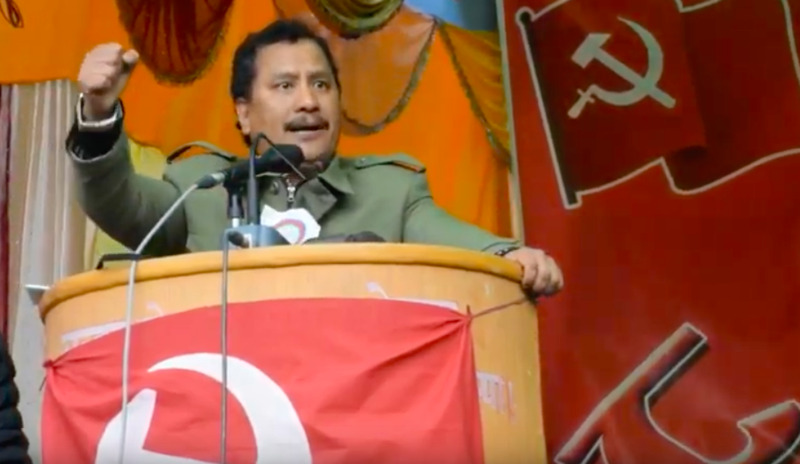 The former Maoist chairman has a soft corner for Netra Bikram Chand and his group, but he is also waiting for the right time to go on the offensive, party insiders say. Days after the explosion outside the Ncell headquarters in Lalitpur that killed one person, and a series of arson attacks targeting telephone towers in a dozen different districts, the needle of suspicion pointed to the Netra Bikram Chand-led Communist Party of Nepal. Earlier this week, the Chand party owned up to the attacks and apologised for the loss of life—but it stopped short of renouncing violence, saying the attack was part of an action against the “comprador capitalists”. The same day, Home Minister Ram Bahadur Thapa told the parliamentary State Affairs Committee that documents and other evidence obtained by the government showed that the Chand party was responsible for the attack. However, Maoist leaders, who are now part of the ruling Nepal Communist Party (NCP) after their merger last year, have yet to make any comments on the attacks--they look akin to what the Maoists did in the initial days of the insurgency--perpetrated by the Chand outfit. Some party insiders say the former Maoist party, led by Pushpa Kamal Dahal, is not too keen on pressing for immediate stern action against the Chand outfit. “The fact that none of the Maoist leaders has refuted the act of violence shows they still hold a soft corner for the Chand party,” a Maoist leader told the Post on condition of anonymity for fear of retribution. At least two other Maoist leaders who are close to Dahal told the Post that a large section of the members of the party does hold sympathy for the Chand group, which was formed after breaking away from Dahal. “Look at the context. This attack has come days after Dahal warned of the birth of a new Maoist party,” said the Maoist leader. Despite alarm from some experts that the government’s continued undermining of the Chand party’s activities could turn into a major security threat, the KP Sharma Oli administration has taken a lackadaisical approach to deal with Chand--and Dahal and Thapa, both key leaders in the ruling party, appear to be maintaining a softer stance. A former chief of one of the security agencies told the Post that Dahal and Thapa won't go on the offensive against Chand. Last year, after Thapa took control of the Home Ministry, the government formed a panel to hold talks with disgruntled groups and armed outfits, including Chand's party. The panel held talks with at least 22 groups and submitted its report in December, concluding that there was no conflict situation in the country. Suresh Ale Magar, a Maoist leader and a long-time colleague of Chand, was a member of the panel. Magar, who had sided with Chand when they left Dahal in 2012 to form another party with Baidya and Thapa, said Dahal was always in favour of bringing the Chand group to talks instead of suppressing them. The Chand outfit not only refused the calls for talks but continued to perpetrate sporadic attacks across the country. Amid this, party insiders said, he garnered sympathy from some members within Dahal’s own party who have not been enamoured with his leadership. This—and Dahal’s unease emanating from his decreasing space in the unified Nepal Communist Party—is making the onetime powerful Maoist chairman feel trapped, said a central committee member of the ruling party, who is a former Maoist. Political analysts have long said that Dahal's decision to merge his party with Oli’s Unified Marxist Leninist communist party was part of his bid to maintain his relevance. After Dahal decided to join mainstream politics in 2006, his party won the first Constituent Assembly elections and emerged as the single largest party. But in the second Constituent Assembly elections in 2013, the Maoists faced a drubbing and were relegated to the third position. Anil Giri contributed reporting to this article.